I'm betting that the best-known person to walk through the doors of Waltham District Court next Tuesday will be Javier Fantauzzi, a 21-year old Lawrence man. He's being arraigned on charges that he stole an $1800 MacBook laptop from Mark Bao, a freshman at Bentley University. Laptops get stolen all the time, but what makes this case different is that Fantauzzi, the alleged thief, is also purportedly the star of a YouTube video that has been seen more than 1.5 million times since it was first uploaded on March 19th. 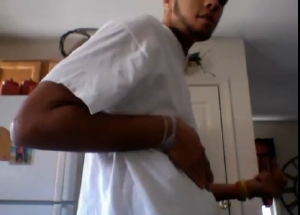 In the video, allegedly made on the laptop stolen from Bao, a man dances to the rap song "Make It Rain" by Tyga. How'd the video surface? After the laptop was stolen, Bao remembered that he'd subscribed to a back-up service called Backblaze, which enabled him to go online from another computer and view the files from his laptop that were automatically being saved on Backblaze's servers. Among them, Bao says, were files created by the new "owner" of his laptop, including the "Dancing with the Stars" audition clip. Bao asked his 10,000 Twitter followers if they thought he should post the video, and they (of course) egged him on. The story of the tech-savvy teen who figured out how to recover his own laptop spread like crazy around the Web last month, attracting coverage on tech blogs and mainstream media like Boston's Channel 7. Bao later posted a message he said he received from the thief, begging him to take the video down. But the court documents related to Bao's case make it clear that the theft and recovery did, in fact, occur. Bao told Bentley police that the laptop was stolen just before 5 a.m. on February 6th. As you might expect, the police didn't exactly launch a campus-wide inquiry, and simply wrote on their report that there were "no suspects at this time." But Bao went back to the Bentley police on March 21st, showing them the videos he'd found, as well as an e-mail address and a Facebook page that he believed belonged to the alleged thief. (The Facebook page has since been deleted.) The next day, Fantauzzi (who isn't a Bentley student) returned to campus with the missing laptop, according to Bentley police. Fantauzzi waived his right to have counsel present, according to the police report, and told them he'd been to a party on campus the night of the theft, "consumed a large amount of alcohol," seen Bao's laptop in a study lounge, and decided to swipe it. In a written statement given to the Bentley police, Fantauzzi said he'd heard the campus police were looking for him, and that he'd decided to turn himself in. "I know I did wrong and I'm here to own up to my mistakes," he wrote. You can read some of the Bentley Police reports on the case here. Reached for comment yesterday afternoon on his mobile phone, Fantauzzi said he wasn't aware of the upcoming court hearing. But, he told me, "I'm not going to lie and say I didn't do it." What do you think? Could this case discourage future laptop poachers? Or is Web-wide embarrassment plus criminal prosecution plus possible jail time a bit excessive for a 21-year-old who has apparently admitted to wrong-doing?